The Prophecies of the BOOK OF REVELATION at last are revealed! The closed, SEALED PROPHECIES are opened. Here Is a startling, eye-opening booklet, dynamically illustrated by nationally famous artist Basil Wolverton, vividly picturing before your eyes the catastrophic events soon to bring the END OF THE WORLD! God's time has come! Now He reveals the terrifying world — catastrophes, soon to hurl this world to oblivion! But first this world must be WARNED! God's time has come to OPEN WIDE to human understanding the awesome prophecies of the BOOK OF REVELATION. Today this solemn warning is being thundered around the world, as a witness! No PLAGUE NEED COME NEAR YOU! You may, if you heed and obey God, be accounted worthy to escape all these things that shall certainly come to pass! It all means that a purpose is being worked out here below! And the time has come for The Eternal — the Creator — RULER of the universe — to reveal to us exactly HOW world events, from here, are going to work out the tremendous CLIMAX of that divine PURPOSE! The whole earth is now shaking with convulsions, preparatory to the mightiest happenings of earth's history! Approximately ONE THIRD of all the Bible is devoted to PROPHECY. Many whole Books of Scripture, especially in the Old Testament — Isaiah, Jeremiah, Ezekiel, and all the so-called "minor" prophets — are devoted exclusively to PROPHECY. But the actual FRAME-WORK, or superstructure, of all the prophecies is found in two prophetic Books — one in the old, the other in the NEW Testament — the Books of Daniel and the Revelation. And in the Book of Revelation, alone, do we find events of the various other prophecies co-related in order of TIME SEQUENCE. ONE important key is that in the Book of Revelation is a STORY-FLOW, relating one future event to another in time order — with occasional INSETS injected into the continuous story-thread. Let us TURN to this Book that has appeared to many as the most mysterious and unfathomable of ALL prophecies. NOTHING could be more intriguing. NOTHING, in today's upset and jittery world, could be MORE IMPORTANT at this hour! For it describes this very HOUR in which we live — it draws back the curtain on the FUTURE! Daniel wrote, at the conclusion of his Book: "I heard, but I understood not" — that is, he heard what the angel had revealed, which Daniel wrote in his Book — but he himself did not understand the very prophecies he had been inspired to write. The angel said to Daniel: "The words are CLOSED UP, and SEALED, till the time of the end" — and the Moffatt translation renders it "till the crisis at the CLOSE" — that is, till this world-crisis at the close of this age! (Dan. 12:8-9.) Again, verse 4: "But thou, O Daniel, shut up the words, and seal the book, even to the time of the end; many shall run to and fro, and knowledge shall be increased." As the prophecies of Daniel were CLOSED and SEALED until this time of the END — this world — crisis at the close — this time of rapid transportation, men running to and fro — this time of INCREASED KNOWLEDGE — so also the prophecies of the Book of Revelation were SEALED! But today we live in the dynamic, exciting, terrible "time of the END" — the world-crisis at the CLOSE of the Age! The prophecies and mysteries of God, sealed until now, are today REVEALED to those whom God has chosen to carry His last Message to the world as a witness! Jesus Christ, Head of His Church, is the REVEALER! Christ has opened these mysteries to His servants! The time has come for God's servants to open up to YOU — to lay bare before your startled eyes — these tremendous prophecies of the Book of REVELATION! I want you, now, to look at this Book! We're ready, now, to come directly to the first chapter and first verse of this mysterious, exciting Book. We're ready, now, to see what it does say — and you have SURPRISES coming! "The revelation of Jesus Christ...to show unto His servants things which must shortly come to pass." 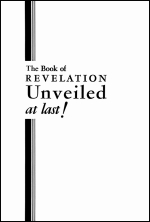 The very word "Revelation" — the English word translated from the original Greek word "Apocalypse," as it is called in one version — means the REVEALING. Not the hiding, sealing, or closing up, but the REVEALING! Yet the prophecy of future world events in this Book was sealed with seven seals! Now notice, GOD gave this prophecy to CHRIST. The first three verses form the introduction. Let us read them: 'The Revelation of Jesus Christ, which God gave unto him, to shew unto his servants things which must shortly come to pass; and he sent and signified it by his servant John: who bare record of the word of God, and of the testimony of Jesus Christ, and of all things that he saw. Blessed is he that readeth, and they that hear the words of this prophecy, and keep those things which are written therein: for the time is at hand" (Rev. 1:1-3). So notice, the prophecy first CAME from God the FATHER! It is the REVELATION — not the concealing, but the REVEALING — the EXPLAINING — the OPENING UP — of JESUS CHRIST, but God gave it to Him sealed! Christ is the WORD — the SPOKESMAN. And He tells us plainly, in John 12:49 and elsewhere, that He spoke NOTHING of Himself, but only as the FATHER commanded Him! Christ is the WORD. Christ is the REVEALER. Now we come to another popular error of men. We hear the expression so commonly — and erroneously — "John the Revelator." But JOHN is not the Revelator. This is not the Revelation of John, it is the Revelation of JESUS CHRIST. It is CHRIST, not John, who does the explaining, the revealing. That is another vital KEY to understanding. So it originated with Almighty God the FATHER. God gave it to CHRIST. Christ sent and signified it by His angel unto His servant John — so John is merely a SERVANT, who BARE RECORD — that is, who RECORDED the Revelation in WRITING. He was merely the private secretary — the stenographer, so to speak — not the Revelator. And now notice, John bare record — or recorded in writing — THREE THINGS: 1st, the Word of God; 2nd, the Testimony of Jesus Christ; and 3rd, all the things that he, John, SAW! And so the Book of Revelation, like all Scripture, is the plain Word of GOD. But part of it is the direct saying, or quotation, of Jesus Christ — the very words of Christ Himself. If you have a "red-letter" Bible or New Testament, printing all the words in red which Christ spoke directly Himself, you'll find a good many passages in the Book of Revelation are printed in RED. And then, John recorded the things that he SAW, in VISION, or, as it is worded, in SPIRIT. Most of the actual PROPHECY of the Book is contained in the things that John SAW, in VISION — and most of these things are SYMBOLS. A BLESSING is pronounced on you for READING these words — provided you are submissive and obedient to KEEP those things which are written therein! The beautiful salutation begins with verse 4, continuing through the remainder of the first chapter. The dominant keynote of the Book — its subject, its theme — is struck in the 10th, or MIDDLE verse of this chapter. The theme is THE DAY OF THE LORD. Let us read it: "I was in the Spirit on the Lord's day, and heard behind me a great voice, as of a trumpet" (vs. 10). The day of the week on which this happened to be written — IF it could have been all written within one day — is not important, and that is not what this verse means at all. It does NOT refer to any day of the week — but to that prophetic period referred to in more than 30 prophecies as "The great and terrible DAY OF THE LORD." The original Greek word here translated "on," — "I was in the Spirit ON the Lord's Day," — is en. In other places where this same Greek word en is used in the New Testament, it is translated "IN" or "INTO," or "during the time of." In Spirit — in VISION — John was carried forward some 1900 years — projected into the DAY OF THE LORD — during the time which is now just AHEAD OF us, to occur in this present generation! In the Weymouth translation, which you can find in public libraries, this verse reads: "In the Spirit, I found myself present on the Day of the Lord." Rotherham's translation: "I came to be, in Spirit, IN the Lord's Day." The Concordant Version: "I came to be, in Spirit, IN the Lord's Day." The BULLINGER translation: "I came to be, BY the Spirit, ON the Day of the Lord." In Spirit, or in the VISION, when John was shown the things of the prophecy — the things which he SAW — he was projected into the period of OUR present, and the immediate future. The same thing happened to the prophet Ezekiel, as chapter 8, verse 3 states: "And he put forth the form of an hand, and took me by a lock of mine head: and the spirit lifted me up between the earth and the heaven, and brought me in the visions of God to Jerusalem." Ezekiel was not actually taken to Jerusalem, but the SPIRIT lifted him up and carried him IN VISION to Jerusalem. In like manner, John, IN SPIRIT, was carried to see IN VISION the events of the DAY OF THE LORD — the events ALREADY, now, beginning to take place on earth — the events YOU AND I SHALL LIVE TO ACTUALLY SEE! This vision is VITAL! The theme, or subject, of the prophecy is NOT the Middle Ages — it is the teeming, chaotic PRESENT — this very time you and I are just now starting to LIVE THROUGH! GOD HELP us, then, to UNDERSTAND! So the very purpose of this Book is to show us of this generation NOW LIVING, the coming world-shaking events of the DAY OF THE LORD — the time of GOD'S JUDGMENTS at this age — END leading up to, and climaxing in, THE SECOND COMING OF CHRIST, and the happy, peaceful WORLD TOMORROW! I have taken time to explain this introduction and salutation — because it is the KEY note of the whole prophecy — the THEME — the SUBJECT of the prophecy. It is IMPORTANT to get our bearings — to get off to a right START — to get the FUNDAMENTALS straight. Message to the Churches The first real Message of the Book is contained in the second and third chapters — the messages to the Seven Churches. These Messages come DIRECT FROM CHRIST — they contain the direct TESTIMONY OF JESUS CHRIST. If you have a red-letter Bible, you will find these letters in red. Here Jesus takes the actual spiritual condition and FUNCTIONING of these seven Churches, then existing in Asia Minor, as a PROPHECY of the spiritual condition and the works and accomplishments, in carrying out Christ's Great Commission, of the true CHURCH OF GOD during the SEVEN successive periods of time up until the END of this age and the second coming of Christ. Men have never understood these seven Messages! They have never known what to look for! These are not messages to the great, visible, PROFESSING churches in all their sectarian divisions and political organizations. These are messages from Christ, the living HEAD of His Church, to HIS OWN TRUE CHURCH in its seven successive eras of time from about 100 A.D., until a period even YET future. Since these messages are not addressed to the public — since they do not concern the PROFESSING organized churches — since they do not contain actual prophecies of present or future WORLD CONDITIONS, with one exception, we pass on over these two chapters, in this booklet. The first five messages to the churches are prophetic of stages of God's true people on earth which have already been FULFILLED, and now are HISTORY. All this identity, and the AMAZING record from history showing how PRECISELY these prophecies were fulfilled, are made plain in our booklet, "A True History of the True Church." And now we pass quickly on to the 4th and 5th chapters, where we find the PRELUDE — or the STAGE-SETTING for the MAIN PROPHECIES of the Book. The remainder of this fourth chapter describes this heavenly setting which John saw in his vision. Around the throne were the 24 elders, seated on 24 smaller thrones, clad in WHITE garments, with golden crowns on their heads. On each side of the throne were the four living creatures — all worshipping God Almighty seated on His throne. Now we come to the vital fifth chapter of the Book of Revelation. Notice: "And I saw in the right hand of him that sat on the throne a book written within and on the back side, sealed with seven seals" (Rev. 5:1). Here is the real BOOK of the PROPHECY. It is significant that this book was in God's RIGHT hand. But this was not the same kind of book we use today, made up of many pages bound together. This was a scroll, or a ROLL — one very LONG sheet of parchment, written on BOTH sides, rolled into a scroll, and SEALED with seven SEALS. That number is significant! Seven is God's number denoting COMPLETENESS. This Book of Prophecy, then, was sealed COMPLETELY — completely CLOSED UP, so it could not be seen or read, much less UNDERSTOOD. Its meaning was sealed — completely HIDDEN. Now notice carefully! "And I saw a strong angel proclaiming with a loud voice, Who is worthy to open the book, and to loose the seals thereof? And no man in heaven, nor in earth, neither under the earth, was able to open the book, neither to look thereon" (verses 2-4). This PROPHECY is SEALED! NO MAN is worthy or able to OPEN UP this prophecy — to read its real and true MEANING! Why haven't men read that plain and simple statement? No MAN can open up — no MAN can REVEAL the meaning of this great prophecy. IT'S SEALED — utterly, completely SEALED — totally CLOSED! Why, then, have MEN been trying to tell the public they could read and reveal this amazing, this ASTOUNDING PROPHECY? But NOTICE — HERE comes the KEY to unlock the doors of understanding! "And one of the elders saith unto me, Weep not, behold: the Lion of the tribe of Juda, the Root of David, hath prevailed to open the book, and to loose the seven seals thereof" (vs. 5). THERE'S the key to this riddle! The Lion of the Tribe of Judah — the ROOT of David — is JESUS CHRIST! No MAN can interpret this momentous prophecy — but Jesus Christ — God the SON — here standing BEFORE the throne of God the Father — here standing at the very RIGHT HAND of God — is able to open these seals, and to REVEAL to us the meaning. JESUS CHRIST is the Revelator! Not John, not some modern church leader, not any man, not any religious organization, sect, or denomination. THIS is the Revelation of JESUS CHRIST, which God the Father gave to HIM! And now notice: "And he came and took the book out of the right hand of him that sat upon the throne" (vs. 7). Now we are coming to the KEY that shall unveil this mystic prophecy that has confused and baffled all the religionists and the churches of this world for the past 1850 years. Jesus Christ is the Revelator who alone can open up the MEANING of this greatest of all prophecies, pertaining to WORLD EVENTS TODAY, and the tremendous world — happenings of these immediate years JUST AHEAD! Before we come to chapter 6, where we see what's actually written in this mystic Book, as Christ begins one by one to strip off these SEALS, notice: "And they sang a new song, saying, "Worthy art thou to take the scroll and to open its seals, for thou wast slain and by thy blood didst ransom men for God from every tribe and tongue and people and nation, and hast made them a kingdom and priests to our God, and they shall reign on earth" (Rev. 5:9-10, RSV). Yes, the VISION appears in HEAVEN — but it portrays EVENTS to occur here ON THE EARTH. They sang a glorious SONG — saying that those whom Christ has REDEEMED are to RULE — they are to REIGN WITH HIM as kings, and to MINISTER to and SAVE people as PRIESTS — where? — up in heaven? — No! Observe this carefully — "THEY SHALL REIGN ON THE EARTH!" Jesus Christ said, "If I go" — and He went to the right hand of God the Father — to the FATHER'S throne, in heaven, — but He said if He WENT, "I will COME AGAIN!.. And He is coming AGAIN to rule all the EARTH as the KING of kings, and the LORD of lords! The very last words of this Book of Revelation are: "He which testifieth these things saith, Surely I come quickly. Amen! Even so, COME, Lord Jesus!" We now come to the sixth chapter of Revelation — the REVELATION PROPER. One by one, Jesus OPENS these seals. Six of the entire seven seals are opened in this sixth chapter alone. Only ONE chapter is devoted to the first SIX of the seven seals. Doesn't that strike you as peculiar? VERY little space is devoted to each of these first SIX seals — so little that SIX of the seven are condensed into one single chapter. There remain yet SIXTEEN WHOLE CHAPTERS in the Book. And since the SEVEN seals cover the ENTIRE PROPHECY — all of its remaining 17 chapters — we are left with 16 chapters for the events of that SEVENTH SEAL ALONE! As we come to this pivotal SIXTH chapter of the Book of Revelation, REMEMBER the stage-setting — it is recording the VISION of John; and altho John himself actually was on an island in the Mediterranean Sea, here on the EARTH, he appeared, in the vision, to be taken up to the very heaven of GOD'S THRONE. The BOOK OF PROPHECY, in the form of a ROLLED SCROLL, is in the RIGHT HAND of God the Father, sitting on the throne. And Jesus Christ, here pictured as the LAMB of God, is STANDING before His Father's throne. The PROPHETIC portions of this writing of John are contained in the things that John SAW, in VISION. Notice, now, the first verse of chapter 6: "And I saw when the Lamb opened one of the seals: and I heard, as it were the noise of thunder, one of the four beasts saying, Come and see." John is recording for us what he SAW, in the vision. He SAW the Lamb, Jesus Christ the Messiah, opening the first of the seven seals. And the four living creatures invited him to come and SEE what was under that first seal. "And I saw, and behold, a white horse; and he that sat on him had a bow; and a crown was given unto him: and he went forth conquering, and to conquer" (vs. 2). And right HERE begins the real MYSTERY. What is this WHITE HORSE? It is merely a SYMBOL. And mark well this fact! — SYMBOLS are susceptible of MANY DIFFERENT INTERPRETATIONS! For generations men have been putting their own HUMAN interpretations on these SYMBOLS. This white horse has been interpreted many different ways. "And when he had opened the third seal, I heard the third beast say, Come and see. And I beheld, and, lo, a black horse: and he that sat on him had a pair of balances in his hand. And I heard a voice in the midst of the four beasts say, A measure of wheat for a penny, and three measures of barley for a penny: and see thou hurt not the oil and the wine. That word "apocalypse" is not an English word. It is a GREEK word. The apostle John wrote this book of Revelation in the GREEK language. And translated into the English language that Greek word apocalypse simply means, REVELATION, or REVEALING, or OPENING UP, or UNFOLDING. Some English translations of the Bible have left the word "apocalypse" untranslated, and have used the original GREEK word for the caption of this entire book. It all means the same thing, whether we use the Greek word apocalypse, or the English word, REVELATION. So the famous FOUR HORSEMEN OF THE APOCALYPSE are merely these four prophetic SYMBOLS of the Book of Revelation. But what are these mystic four horsemen? What do these symbols represent? Who has the right interpretation? The answer is that no man, no organization of men, whether religious or otherwise, has any power or ability to reveal this meaning. Only JESUS CHRIST was found worthy, and able, to make this meaning known. JESUS CHRIST is the Revelator! This is the Revelation of JESUS CHRIST — not of John — not of any human religious leader, not of any sect, church, or religious society or organization! That is the paramount key to the Book of Revelation! That ought to make plain to you WHY the men of this world — religious leaders or church denominations — have not been able to open to you the true and significant meaning of these four horsemen! Now keep in mind two things: first, Jesus Christ is called in the very first verses of John's gospel, the WORD of God — God's SPOKESMAN. Jesus, in Person, 1900 years ago, was the personal, living WORD OF GOD. But today we have the written Word of God — the Holy Bible. The entire BIBLE is the WORD OF GOD. Its real divine Author, then, is JESUS CHRIST — the whole BIBLE is His written WORD! And now I want you to realize a most important FACT, bearing on our problem, which most of you never realized before. Haven't you supposed, along with nearly everyone else, that Jesus spoke in PARABLES in order to make His meaning clearer — as a sort of illustration, so that people would better understand His meaning? Well you have supposed WRONG! On the contrary, believe it or not, Jesus spoke in parables to cover up, to hide the true meaning from the crowds that constantly followed Him! This knowledge puts in our hands the KEY that will unlock these symbols of the Book of Revelation. "And when He was alone, they that were about Him with the twelve asked him of the parable. And He said unto them, Unto you it is given to know the mystery of the kingdom of God; but unto them that are without, all these things are done in parables: that seeing they may see, and not perceive; and hearing they may hear, and not understand; lest at any time they should be converted, and their sins should be forgiven them" (Mark 4:10-12)...and then Jesus proceeded to explain in plain language the meaning of the parable to His disciples! And in exactly the same manner, we find in this sixth chapter of Revelation a prophecy cloaked mysteriously in SYMBOLS which has HIDDEN the true meaning from men these 1850 years! And so, if we want to really UNDERSTAND, we must do as those disciples did — we must go to Jesus, who alone is the true Revelator — and since His message to us of this day is now the WRITTEN WORD OF GOD — the Bible — we must look to see where in His written Word, this same Jesus explains to us, in plain language, the same identical events which are represented by these symbols. Did Jesus, then, in plain language, explain these same events of this world crisis at the close of this Age — these turbulent world — war days leading to the DAY OF THE LORD, and the Second Corning of Christ? He did! When His disciples came to Him on Mt. Olivet — when they to whom He revealed His parables — they to whom it was given to know these mysteries — came to Him privately, and asked Him: "Tell us, when shall these things be? and what shall be the Sign of thy coming, and of the end of the world?" Jesus gave, in plain language, a startling prophecy of these very world conditions of TODAY, and our immediate future! Here, then, is the explanation of the SYMBOLS of Revelation 6! Here is the KEY that opens up the meaning of the seals! "And Jesus answered and said unto them, Take heed that no man deceive you. For many shall come in my name, saying I am Christ; and shall deceive many. And ye shall hear of wars and rumors of wars: see that ye be not troubled: for all these things must come to pass, but the end is not yet. For nation shall rise against nation, and kingdom against kingdom: and there shall be famines, and pestilences, and earthquakes, in divers places. All these are the beginning of sorrows" (Mat. 24:3-8). I want you to notice a consistent principle in this prophecy of Matt. 24, and of the 6th chapter of Revelation. SEVEN successive things, or events, are to occur. As an example: The very first condition Jesus foretells is that of FALSE PREACHERS, misleading and deceiving, not the few, but the many! And so the next thing Jesus said would occur was WARS, and rumors of wars. There were wars in those days. But wars have not stopped. They have grown progressively worse and worse, more and more horrible and destructive, and today, we face the question of whether human life can survive the next atomic and hydrogen bomb war! Yes, as Scripture says truthfully, SIN and sinful men wax worse and worse — and not better and better, as men like to believe! 2nd, wars, climaxing at this crisis at the close of this age in WORLD WARS — nation against nation, and kingdom against kingdom. We are now in the second recess between stages of WORLD WAR! And that's where we are, right now! And this is just the beginning of the colossal WORLD EVENTS prophesied for this 20th century A.D.! The first two world wars have occurred. Rumors of wars will continue. Next to strike the earth are famine, disease epidemics and World War III — all of such staggering magnitude as this world has never dreamed! But now compare that with the first four seals of Revelation 6. Here is the revelation of Jesus Christ. Here is Jesus' own interpretation, in plain language of these mystic symbols of the four horsemen. The first was a WHITE HORSE. Many men, using human interpretation, have looked over into the 19th chapter of Revelation, where we find the description of the glorious return of Christ pictured as coming on a white horse, and have made the great error of deciding that this first seal, then, since it is a white horse, pictures the second coming of Christ. But CHRIST'S OWN revealing of the meaning is that this white horse of the first seal pictures exactly the opposite — those preaching a FALSE Christ, different from the Christ of the New Testament! It refers to this GREAT DECEPTION that has descended like a dark cloud to cover the earth and hide from it the glorious truth of God! And so the second seal pictures a RED horse — the color of blood — and this horseman, as Jesus Himself reveals, is WAR. "And there went out another horse that was red: and power was given to him that sat thereon to take peace from the earth, and that they should kill one another: and there was given unto him a great sword" (Rev. 6:4). And in like manner the third horse is the FAMINE: "And when he had opened the third seal, I heard the third beast say, Come and see. And I beheld, and, lo, a black horse; and he that sat on him had a pair of balances in his hand. And I heard a voice in the midst of the four beasts say, A measure of wheat for a penny, and three measures of barley for a penny; and see thou hurt not the oil and the wine (Rev. 6:5-6). And, fourth, following in the wake of famine, DISEASE EPIDEMICS: "And I looked, and, behold, a pale horse: and his name that sat on him was Death, and Hell (the grave) followed with him. And power was given unto them over the fourth part of the earth, to kill with the sword, and with hunger, and with death, and with the beasts of the earth" Rev. 6:8). It is mighty important to know — and to be prepared — for you need have no fear, if you heed and seek the protection of God! Back quickly to Matthew 24. Remember, we are now in the time of the second intermission of world war. Famines and disease epidemics have increased in magnitude in recent years, but the final GREAT world-wide famine and disease epidemic has not yet struck. These events brought us to verse 8. We are already INTO these events, but we haven't reached the final FURY of them. So notice, now, what is said of THESE things: "All these things are the beginning of sorrows" (Mat. 24:8). Yes, THESE things, even, are only the BEGINNING sorrows — or, more properly translated, of TRAVAIL, or TRIBULATION! Let us notice exactly how Jesus explained this FIFTH world-shaking event in PLAIN language. 'Then shall they deliver you up to be afflicted, and shall kill you: and ye shall be hated of all nations for my name's sake" (Mat. 24:9). Notice, Jesus used two pronouns — "THEY," and "you." Then THEY shall deliver YOU up to be afflicted, and shall KILL you." Remember this: In New Testament Bible language the pronoun "you," unless otherwise clearly defined, refers either to truly converted CHRISTIANS, or to NATIONAL Israel or Judah or to both Christians and Judah or Israel. If it is speaking spiritually and individually, the pronoun "you" refers to those who are truly begotten children of God. If the context is speaking nationally, it refers to Israel, or Judah, or both. Right here we have to explain another KEY to nearly all prophecies. There is a DUALITY in nearly everything in God's PLAN in working out His purpose here below! There was the first Adam, and Christ the second Adam. There was the Old Covenant, and there is the NEW. This duality runs through the entire plan of God. It runs also through the prophecies. There is usually a former, typical, and then a final anti-typical fulfillment of many prophecies. Not understanding this vital KEY, many are in total error in their attempts to understand or explain prophecies. This is described more plainly in the modern English of the Moffatt translation of Luke's account of this same prophecy. Luke 21:23-24: "For sore anguish will come upon the land and wrath on this people; they will fall by the edge of the sword, they will be carried prisoners to all nations, and Jerusalem will be under the heel of the Gentiles TILL the Times of the Gentiles expire." That is speaking of WAR — of NATIONAL invasion and captivity. That actually did happen to JUDAH in 70 A.D. But that was merely the typical forerunner. The climactic major event of this prophecy is yet to occur, just shortly before the coming of Christ! Turn again to Matthew 24: "And then shall many be offended, and shall betray one another, and shall hate one another. And many false prophets shall rise, and shall deceive many. And because iniquity shall abound, the love of many shall wax cold. But he that shall endure unto the end, the same shall be saved...For then shall be great tribulation, such as was not since the beginning of the world to this time, no, nor ever shall be...For there shall rise false Christs, and false prophets, and shall shew great signs, and wonders; insomuch that, if it were possible, they shall deceive the very elect" (Mat. 24:10-13, 21, 24). This is also speaking individually of truly Spirit-begotten CHRISTIANS who have become so lukewarm, so out of prayerful — contact with God, that they will not be accounted worthy to escape all these things. And that phase of this Great Tribulation is very clearly brought out in the opening of the 5th seal of Rev. 6: "And when he had opened the fifth seal, I saw under the altar the souls of them that were slain for the word of God, and for the testimony which they held: And they cried with a loud voice, saying, How long, O Lord, holy and true, dost thou not judge and avenge our blood on them that dwell on the earth? And white robes were given unto every one of them; and it was said unto them, that they should rest yet for a little season, until their fellowservants also and their brethren, that should be killed as they were, should be fulfilled" (Rev. 6:9-11). NOTICE that! Here is the GREAT TRIBULATION! And this 5th seal pictures it as a time of martyrdom of saints — of truly converted, begotten children of GOD! Notice, verse 9. Those that were slain, in a former and a typical Tribulation — as actually millions were slain many centuries ago — are crying out, "HOW LONG, O God, before you shall avenge our blood on the powers that martyred us?" They knew that GOD said, "Vengeance is mine." They knew that in the terrible DAY OF THE LORD, God is going to take vengeance by sending His plagues on the persecuting powers! And those plagues of the DAY OF THE LORD — the time of God's vengeance upon this great persecuting power — will occur at the precise time of the second coming of Christ! NOTE IT. NOTE IT CAREFULLY! These martyrs that were killed, centuries ago, allegorically are asking how long before the second coming of Christ and the end of this age? And HERE'S the tremendous answer! It shall not occur until another great TRIBULATION — another martyrdom of saints — until their fellow-servants and their Spirit-begotten brethren in the Lord shall be killed, as they were. And that is speaking of the final GREAT Tribulation. It will be a time of WAR and national invasion and captivity of God's nation ISRAEL! Not Judah! These prophecies refer to the so-called lost ten tribes of Israel. WHERE are they? — WHO are they, today? Notice, this Tribulation — this MARTYRDOM OF SAINTS — must occur and be completed BEFORE God pours out the vials of His Wrath — HIS PLAGUES — at the second coming of Christ. The disciples had asked Jesus when His Coming would occur, and the end of the world — the end of this AGE! The false preaching was not the end. The wars and rumors of wars were not the end. But in Matthew 24: 14, Jesus interrupted to tell them WHEN the end shall come — after the very event now taking place — yes, actually taking place this minute. "And this gospel of the kingdom shall be preached in all the world for a witness unto all nations; and then shall the end come." THERE is Jesus' answer. He had warned them of false prophets deceiving the MANY — saying that Jesus was the Christ — but doing away with His message — His Gospel — which was the KINGDOM OF GOD — the government of God — the RULE of God. God rules by HIS LAWS — and the whole world has been deceived into transgression, which is SIN, by believing that God's LAW and God's RULE over our lives is done away! Men have been deceived into believing they could hold to the traditions of men, and by WORSHIPPING CHRIST, still be saved. But Jesus Himself said (Mark 7), "IN VAIN do ye worship me, teaching for doctrines the commandments of men — making the Word of God of none effect through your TRADITION." But, just before the END Jesus said: "THIS gospel OF THE KINGDOM" — of the government of God — the RULE of God the COMMANDMENTS of God — the same Gospel that JESUS PREACHED — shall go to all the world for a witness unto all nations — and THEN shall the end of this world come. If we are to bring you the REVELATION OF JESUS CHRIST, we certainly cannot bring you the popular interpretations you have been hearing from men — from the great religious leaders of this world. The great men of this world have confused the Great Tribulation that is coming, with that period revealed in more than 30 prophecies in the Bible as The DAY OF THE ETERNAL — or, the Day of the Lord. There are to be signs in the sun, moon, and stars. But these heavenly signs occur — WHEN? Did you catch it? — IMMEDIATELY AFTER THE GREAT TRIBULATION. The Great Tribulation, which Jesus describes here in Mat. 24, is His PLAIN-LANGUAGE explanation of the 5th SEAL of Rev. 6. I want to give you further details of this, both from Mat. 24, and from Rev. 6, a little later; but right now I want you to notice in Rev. 6, what immediately fallows the Great Tribulation of the 5th seal. "And I beheld when he had opened the sixth seal, and lo, there was a great earthquake; and the sun became black as sackcloth of hair, and the moon became as blood; and the stars of heaven fell unto the earth, even as a fig tree casteth her untimely figs, when she is shaken of a mighty wind" (Rev. 6:12-13). NOTICE it! Will you read it with your own eyes, in your own Bible. Here in this 6th chapter of Rev., as these 6 seals are opened, we have 1st, false preachers; 2nd, wars climaxing in world wars; 3rd, famines; 4th, disease epidemics; 5th, GREAT TRIBULATION — martyrdom of saints; 6th, the heavenly signs, in the sun, moon, and stars. And then WHAT NEXT — what is to follow this 6th seal? THE GREAT DAY OF GOD'S WRATH — and that, as I shall show you, is the great DAY OF THE LORD! Now quickly turn to the prophecy of Joel in the Old Testament. "The sun shall be turned into darkness, and the moon into blood, before the great and terrible day of the Lord come" (Joel 2: 31). THERE IT IS! In Mat. 24:29 you read in your own Bible that the heavenly signs in the sun, moon, and stars would occur immediately after the Great Tribulation. In Rev. 6 you saw with your own eyes that the heavenly signs in the sun and moon of the 6th seal follow immediately AFTER the Great Tribulation, or the martyrdom of saints, of the 5th seal. Also you saw there, that following these heavenly signs of the 6th seal was to come the terrible day of GOD'S WRATH. So here we have three successive world — shaking events to come — first, and, now, next to occur in a very few years, THE GREAT TRIBULATION. Second, immediately after the Tribulation, the heavenly signs in the sun and moon and stars. Third, following the supernatural signs in the heavens, the terrible DAY OF THE LORD! Now notice how God inspired the prophet Zephaniah to describe it: 'The great day of the Lord is near, it is near, and hasteth greatly, even the voice of the day of the Lord: the mighty man shall cry there bitterly. That day is a day of wrath, a day of trouble and distress, a day of wasteness and desolation, a day of darkness and gloominess, a day of clouds and thick darkness...And I will bring distress upon men, that they shall walk like blind men, because they have sinned against the Lord: and their blood shall be poured out as dust, and their flesh as the dung" (Zeph. 1:14-15, 17). THIS is the time of GOD'S wrath. THIS is the time of GOD'S PLAGUES sent upon the sinners of this world. God says HE will bring this distress upon defiant and sinful men who hate truth and peace, and love evil. THIS is the time of the PLAGUES God shall send — but this is not the Great Tribulation, as men have supposed! If you would know what is going to happen NEXT in the world — if you would know what is as sure as the rising and setting of tomorrow's sun — what is coming in your life-time — what you are going to live through — it is vital to understand the distinction between the Great Tribulation and the Day of the Eternal. You have probably heard a great deal about the Great Tribulation — if you have heard any preaching about prophecy at all. But you probably have heard very little or nothing about the DAY OF THE ETERNAL — and yet, this DAY OF THE LORD is described in more than 30 different prophecies scattered through both Old and New Testaments. But The Great Tribulation is spoken of by this term: The Great Tribulation, only in Matthew 24:21, 29! WHY? Religious leaders have SUPPOSED that all these prophecies about the Day of the Eternal — the time of GOD'S WRATH — of the PLAGUES — are identical with The Great Tribulation. They have SUPPOSED that the Great Tribulation is GOD'S wrath — GOD'S plagues upon the sinners of the world. The Great Tribulation is not the wrath of God — just the opposite. This is the wrath of SATAN THE DEVIL. He knows that he has but a short time. When God intervenes — when God's PLAGUES fall — when CHRIST returns to this earth as the KING of kings and the LORD of lords, to rule the earth, Satan knows full well he will be through. The Great Tribulation, as I shall show you — if you will just keep both your mind and your Bible open — is Satan's last persecution and martyrdom against the true begotten sons of GOD whom he can't deceive, as he has deceived the world as a whole! Now turn again to Rev. 6. Those of the former great martyrdom of saints are told that the JUDGMENTS OF GOD — the plagues which lead up to, and occur at the time of CHRIST'S return to earth — cannot come until their fellow-servants and their brethren — other Spirit-begotten Christians — should be killed as they were! Here is The Great Tribulation — another coming martyrdom of God's people! And what follows? The 6th seal, we have seen, will mark the beginning of the intervention of God in world affairs — the terrifying signs in the heavens — and then men shall cry out, "The terrible day of GOD'S WRATH is come!" "And the heaven departed as a scroll when it is rolled together, and every mountain and island were moved out of their places. And the kings of the earth, and the great men, and the rich men, and the chief captains, and the mighty men, and every bondman and every free man hid themselves in the dens and in the rocks of the mountain; and said to the mountains and rocks, Fall on us, and hide us from the face of Him that sitteth on the throne, and from the wrath of the Lamb: For the great day of his wrath is come, — and who shall be able to stand? (Rev. 6:14-17). You NEED NOT FEAR OR WORRY over the things coming on the earth in the meantime. In this same prophecy of Jesus as reported by LUKE, regarding the world disturbances now ahead — regarding The Great Tribulation and the DAY OF THE LORD — Jesus ended His Olivet prophecy with these assuring words: "Watch ye therefore, and pray always, that ye may be accounted worthy to escape all these things that shall come to pass, and to stand before the Son of man" (Luke 21:36). Notice! For 6,000 years God has sent His loving Messages to mankind. In love God revealed His law — His WAY of life that would lead to everything good and desirable — to our first parents, Adam and Eve. God has sent all His prophets with HIS Message of PEACE, revealing to mankind the WAY to peace and happiness — but men have rejected the message, and killed the prophets. They crucified God's SON, who brought the GOOD NEWS of the KINGDOM OF GOD — which is The WORLD TOMORROW — they martyred Jesus' APOSTLES who went out into the world with the Message of God's way of life, and GOD'S RULE over our lives. All these men of God have pleaded with this rebellious world in love. They have brought a Message of PEACE, of LOVE, of MERCY and compassion. Through them God has pleaded with this stiffnecked and self-willed world for 6,000 years. God has warned the world of where its own ways and devices will finally lead — to the total annihilation of human life from off this planet! In love and in tender mercy, God has given this stubborn misguided human race every chance for 6,000 long years, to save itself from a self-imposed destruction. But men would not heed. THEY WILL NOT HEED TODAY. They continue, even now, to devise forces of destruction that will result in the suicide of the human race, unless God does intervene. But God is about to step in and speak to this rebellious and hell-bent world in the only language the world will heed — God will now punish this world for its evil! As any loving parent punishes his child who will not listen to kind and loving admonition, so now God is going to punish this world with just judgments — with PLAGUES so terrible that the world will at last be forced to turn from its wicked ways, and to seek God and HIS WAYS that lead to peace and everything good. God will prevent the suicide of humanity. He will save this evil world from itself. And that is the period coming, described in more than 30 different prophecies scattered through both Old and New Testaments, as The DAY OF THE LORD, which shall lead directly into the SECOND COMING OF CHRIST, to bring us, at last, WORLD PEACE! But, as we begin the 7th chapter of The Book of Revelation, we find that the DAY OF THE ETERNAL — the time of these terrible plagues God shall send — is to be held up temporarily, until a certain other event of GOD'S doing takes place. Notice the introduction of chapter 7 of this greatest prophecy ever written: "And after these things I saw four angels standing on the four corners of the earth, holding the four winds of the earth, that the wind should not blow on the earth, nor on the sea, nor on any tree. And I saw another angel ascending from the east, having the seal of the living God: and he cried with a loud voice to the four angels, to whom it was given to hurt the earth and the sea. Saying, Hurt not the earth, neither the sea, nor the trees, till we have sealed the servants of our God in their foreheads. I heard the number of them which were sealed: and there were sealed an hundred and forty and four thousand of all the tribes of the children of Israel" (Rev. 7:1-4). Now consider carefully a few important points. First, the preceding words show that the judgments of The DAY OF THE LORD have come at this exact juncture. But God holds it back. Notice that just as the DAY OF THE LORD is about to strike, John sees in his vision four angels, holding back the four winds which are about to blow on the earth. You will see, a little later, that these winds blow the 7 TRUMPETS which are to follow. These, of course, are symbols, but they represent things this world will find are very real. But they are restrained until the SERVANTS OF GOD are sealed in their foreheads. First to be sealed are the 144,000. You have probably heard many interpretations. They are all in error. Men are unable to interpret this prophecy. The first thing to notice is that the TIME of the sealing of this 144,000 is yet in the future — it is after The Great Tribulation and the heavenly SIGNS, and just before the plagues of God's Judgments! It has not happened yet! Second, this prophecy is plain, and means just what it says — 144,000 of the 12 tribes of Israel — 12,000 of each tribe. Where are they today? Where are the lost ten tribes? But these 144,000 are not all! After this I beheld, and, lo, a great multitude which no man could number, of all nations, and kindreds, and people, and tongues, stood before the throne, and before the Lamb, clothed with white robes, and palms in their hands...And one of the elders answered saying unto me, What are these which are arrayed in white robes? and whence came they? And I said unto him, Sir, thou knowest. And he said to me, These are they which came out of great tribulation, and have washed their robes, and made them white in the blood of the Lamb" (Rev. 7:9, 13-14). And what is sealed in the foreheads? They are sealed by the Holy Spirit, in their foreheads. If you will turn to chapter 14:1, you will see that it is the Father's name that is written there. Jesus' very last prayer for His Church was that they would be kept in the FATHER'S name. Today we find the churches of this world under every possible man-made name; many named after men. But 12 times in the New Testament His own Church is the CHURCH OF GOD — yes, GOD'S Church. Now how about this innumerable multitude? They have come through THE Great Tribulation. God will not send His frightful PLAGUES to punish the world, until He has first sent a great supernatural warning. God has warned the world through all His prophets — through His Son Jesus Christ — He is warning the world right now through this very work. But God is a God of mercy and compassion. He will yet warn this world once again — by supernatural signs, in the sun, the moon, and the stars. God will leave men no excuse. And after The Great Tribulation, when men are seized with stark terror at these supernatural heavenly signs, multiplied thousands will at last recognize that it is really GOD warning them! Yes, multiplied thousands who now hear this warning from God will not heed it now. They are deceived. They still believe and follow their various human leaders, or groups. Their minds are not fully opened to recognize this as God's last warning to this world! They are not repenting or turning to God, now! Oh, how well I know that! But when they see these things actually occur which they heard from no others — when they have seen how the world was deceived and misled about the Great Tribulation, and they have gone through it — when they see these terrifying supernatural SIGNS in the heavens, then, at last, hundreds of thousands of them — perhaps even some of you — will at last recognize the TRUTH, and at last turn to God in complete submission, fully repenting, and coming through Jesus Christ the Saviour of the world! We of this ministry well know that our real reward in the harvest of precious lives will mostly come after our labors are finished! But now we come to chapter 8. Here is the opening of this 7th seal. And what is this seventh seal? Remember, as each seal was opened, John recorded what he saw, in his vision. In every case, the things he saw were symbols — but these symbols represent actual world events occurring in a definite time-order. So notice what John saw, when this seventh seal was opened: "And when he had opened the seventh seal, there was silence in heaven about the space of half an hour. And I saw the seven angels which stood before God; and to them were given seven trumpets" (Rev. 8:1-2). Neither do they follow the closing of the 7th SEAL. They are — they constitute the 7th seal. This seventh seal occurs, then, in seven successive stages. Each of these seven stages, or parts of the seventh seal is called a TRUMPET. These trumpets are PLAGUES which God shall send in physical punishment of the forces of evil in this world. Notice, at the end of the 6th of these trumpets, how they are plainly called PLAGUES: "And the rest of the men which were not killed by these plagues yet repented not of the works of their hands, that they should not worship devils, and idols of gold; and silver, and brass, and stone, and of wood: which neither can see, nor hear, nor walk" (Rev. 9:20). A trumpet is an instrument into which one blows. A trumpet sounds by blowing wind through it. These seven trumpets, which compose the seventh seal, follow immediately after the 6th seal. At the time of the 6th seal, described in the last of the 6th chapter of Revelation, it was announced that "the GREAT DAY OF GOD'S WRATH" was come. These symbolic TRUMPETS portray, then, THE DAY OF THE LORD — the day of GOD'S WRATH! The day God intervenes in world affairs to PUNISH this world for its EVIL — the day God pleads with all flesh in the physical language it can UNDERSTAND! — and, as Zephaniah 1:16 says: "A day of THE TRUMPET and alarm against the fenced — that is, fortified or defended, cities, and against the "high towers" — that is, military fortifications. The TRUMPET was always blown as a warning of war, or approaching armies. It signifies war and destruction. When ISRAEL turned a deaf ear to all God's prophets — rejected God's loving pleading through preaching, God punished ancient Israel by sending the armies of Assyria to conquer them. When Judah disobeyed worse than Israel, God Almighty sent the armies of the CHALDEANS to conquer them. As God steps in to punish the whole world — yes, ALL NATIONS, for their evil, which is destroying them and bringing such suffering and unhappiness on all their peoples, the TRUMPETS, or alarms of WAR, are sounded. Trumpets are blown by wind. Now again notice: "And after these things I saw four angels standing on the four corners of the earth, holding the four winds of the earth, that the wind should not blow on the earth, nor on the sea, nor on any tree" (Rev. 7:1). These winds were held back from blowing these seven trumpets until the sealing of the 144,000 and the great innumerable multitude that came out of The GREAT TRIBULATION from all nationalities and peoples. They who repent and turn to GOD for protection are first brought under the divine protection, so that just as God protected the children of ISRAEL when He poured out the plagues on ancient Egypt, so shall He protect ALL His children who rely on Him from these plagues now about to come on the modern BABYLON! And, incidentally, the plagues God sent on Egypt in the days of Moses were a direct type of these plagues that shall now be poured out on BABYLON. Those protected from those ancient plagues were taken under Moses to the promised land, Palestine. Those saved from these plagues will be taken by CHRIST into the KINGDOM OF GOD — to be set up on earth with headquarters in PALESTINE. The first four of these trumpet-plagues are described in chapter 8 as winds that blow on the earth, trees, rivers, and seas. You will read that in verses 6 through 12, chapter 8 of the Book of Revelation. The last 3 trumpets are called WOES, because of the terrible WOE that shall befall the forces of evil on earth. This is stated in the 13th and last verse of chapter 8. The first WOE, which is also the 5th trumpet, is described in chapter 9, verses 1-11. The power that causes the destruction, this time to men, comes out of the symbolic "bottomless pit." This is interpreted in Revelation 17:8-14. There we learn that a rebirth of the ancient ROMAN EMPIRE is the power which emerges out of "the bottomless pit" or abyss — a condition of underground existence not visible to the world. Verse 7 shows this FUTURE power will be a WAR-making, revived fascist power. It is described in prophecy as a power to the NORTH of Palestine, because the prophecies always speak from the focal point of PALESTINE — to the north, and west. The second WOE, with its symbols of horses and horsemen, is interpreted by Ezekiel 38:4, 15, and is also referred to as an event in the DAY OF THE ETERNAL in Joel 2:4. This refers to a tremendous military power — also to the NORTH — due north! They come with an army of two hundred million! Think of it — an army of two hundred million! World events are now moving rapidly to make possible the creation of a Communist Eurasian army of that unbelievable manpower! Yes, it's time to wake up to what's taking place today — the true significance of the time in which we live, and where it is leading! Before the THIRD WOE — the last trumpet — we find the two witnesses described. Men have come forth with every possible interpretation of these witnesses. Notice the time element. They end their mission (described in chapter 11) at the time of the end of the second WOE. (Verses 12-14). Their mission lasts only 3 1/2 years. So, contrary to erroneous human interpretations, their mission has not as yet even begun. They are endued with supernatural protection, and they give out God's last warning to the evil powers of earth delivered through human instrumentalities, before this final Trumpet sounds. They are to be killed by "the BEAST," symbol of a power described in Revelation 13 and 17, and identified by Daniel 2 and 7 as the resurrection of the ancient ROMAN EMPIRE. Now comes the third woe — the 7th and last TRUMPET. What is this 7th trumpet? In many other prophecies it is recorded that the second coming of Jesus Christ to this earth — the time of Christ's literal bodily return to this earth shall occur at the time of the last trump! The same Jesus who came to earth 1900 years ago, taught the way of happy living which men rejected, was crucified, resurrected from the dead, and ascended to heaven — this same Jesus is coming again in almighty POWER and GLORY. He is corning as world RULER — as KING of all kings — as LORD of all lords, to rule all nations, and to enforce the way to PEACE! And His coming shall occur at the last trump. You will find that in I Corinthians 15:52, I Thessalonians 4:16, Matthew 24:31. We know from these prophecies that this last trumpet is the time for the actual appearing of Christ as WORLD RULER! But what else is described? Notice the sounding of the 7th trumpet. THERE IT Is! It is announced that the WORLD-RULE of Jesus Christ over all nations has arrived. All human government on earth shall fall, under the divine power of Almighty God. Men have never wanted God's rule — even though it is the only way to peace, happiness and joy. And so the rulers of human governments over mankind are found angry! They shall have been deceived by the false teaching about a secret rapture theory into believing that this is the ANTI-Christ! They shall fight against Christ and His rule over the earth. Yes, when the 7th trumpet is sounded the nations are going to be angry. Once again it is proclaimed "Thy WRATH is come." The only thing described under the opening of this 7th trumpet that could possibly be the 3rd woe is THE WRATH OF GOD! But all the trumpets have been plagues, pouring out the WRATH of God — His punishments to bring this hell-bent world to its senses and to a happy peace! The 7th trumpet consummates this wrath! And what is it that consummates — fills up — completes, the wrath of God? "And I saw another sign in heaven, great and marvelous, seven angels having the seven last plagues; for in them is filled up the wrath of God" (Rev. 15: 1). The Moffatt translation renders it, "For they complete the wrath of God." In the 14th chapter, and 10th verse of Revelation, it is stated that these 7 last plagues are to be poured out "in the presence of the holy angels, and in the presence of the Lamb." "The LAMB" is a symbol representing JESUS CHRIST. And when He shall come to rule the world, all the holy angels are coming from heaven with Him! Notice that in Jesus' own prophecy: "When the Son of man shall come in his glory, and all the holy angels with him, then shall he sit upon the throne of his glory: And before him shall be gathered all nations: and he shall separate them one from another, as a shepherd divideth his sheep from the goats: And he shall set the sheep on his right hand, but the goats on the left. Then shall the King say unto them on his right hand, Come, ye blessed of my Father, inherit the kingdom prepared for you from the foundation of the world" (Mat. 25:31-34). Jesus Christ is coming to rule. The KINGDOM OF GOD is a kingdom — a government, bearing rule over every other kingdom on earth. But the KINGDOM of God also is described by Jesus and throughout the Bible as a family finally grown into the great world-ruling DIVINE NATION — a nation of IMMORTALS. Jesus taught that we may inherit the Kingdom of God, but only by being first begotten of God, and then born of God. The apostle Paul said plainly that flesh and blood — that is, a mortal human — cannot inherit the Kingdom of God. It is not a mortal kingdom. It is not a human kingdom. It is a divine kingdom into which humans may be finally born, when they are changed — that is, converted, from mortal to immortal — from human to divine! Now notice carefully! At Christ's coming, the DEAD in Christ are to be resurrected immortal. The living in Christ (I Cor. 15:50-54) shall be changed — converted — in the twinkling of an eye, from mortal to immortal. They are then born into the Kingdom of God. They then come into their inheritance of the Kingdom of God. And Jesus will then say, "Come, ye blessed of my Father — inherit the Kingdom prepared." Jesus Christ is then sitting on His throne — KING of the WORLD. When He comes all the holy angels come from heaven with Him. And the 7 last plagues are poured out at His coming — actually in the very presence of Christ and all the holy angels! Yes, how plain! So the 7th Trumpet, then, like the 7th Seal, is divided into seven parts — the 7 last plagues. The 7 last plagues are — they constitute — the 7th trumpet, just as the 7 trumpets are, and constitute, the 7th SEAL. The 7 seals cover the whole prophecy! This sequence and seven-fold arrangement of events is the one great KEY to the long-closed Book of Revelation. The 7 last plagues complete the WRATH of God — they are the last 7th part of the seventh seal, and a part of the 7th SEAL. They show the coming of Christ to bring this world peace — by forcing the nations to be governed by the government of GOD — and God governs by His laws! Yes, CHRIST is the way — and the only way to peace, and to happiness, and to LIFE ETERNAL! Chapter 12 is an inset chapter, injected into the main story-thread. Just as any writer will stop his narrative at a certain point, to go back and sketch a different scene involving different characters and events, bringing them up to, and connecting them with, his story-thread at that juncture, so here John pictures the TRUE CHURCH, from the time prior to Christ's birth (verse 4), through His birth, resurrection and ascension (verse 5), and the 1260 years of persecution when the TRUE CHURCH was forced to flee completely beyond the bounds of organized government persecution. The TRUE CHURCH has always existed. The church of chapter 17 is the great false church. Revelation 12 brings the story of the true church to the present, when the devil, knowing he has just a short time (verse 12), persecutes the true Church, pictured as a remnant or small in number, and keeping the Commandments of God (verse 17). Chapters 15, 16 describe THE SEVEN LAST PLAGUES, which are the third woe or seventh Trumpet. These are God's judgments against this world's false system, "Babylon" (Rev. 18:4, 8:10). Israel is today in Babylon — deceived! We are God's people, Israel — in Babylon today, as Israel was in Egypt when God's plagues were on Egypt! And God calls us out (Rev. 18:4) and tells us to keep His commandments! The 19th chapter shows the second coming of Christ, and the 20th the thousand year reign on earth (Rev. 5:10) — 21st and 22nd chapters the new heaven and new earth through eternity. But now, finally, do you realize where we stand today. We are in the cold-war semi-chaotic lull between the 2nd and 3rd world wars. But one thing is prophesied for NOW! One of these prophesied events is taking place this instant. In His great Olivet prophecy which was the very key to the symbols of Revelation, the disciples asked Jesus privately what would be the sign of His coming, and the end of this WORLD — today's world! When Jesus told them of the many who would go forth preaching in His Name, proclaiming that Jesus is the CHRIST, yet deceiving the world as to Christ's gospel — that was not the END. The famine and the pestilence to come was not the sign of His coming and of the end of this world. The series of WORLD wARS was not the sign of His coming, and of the end. It is only in verse 14 of this prophecy that He gave it. I want you to notice the tremendous significance of this: "And this gospel of the kingdom shall be preached in all the world for a witness unto all nations; and then shall the end come" (Mat. 24:14). There it is! Jesus proclaimed the Gospel of the KINGDOM OF GOD — which is the GOOD NEWS of The WORLD TOMORROW! Soon men went out proclaiming CHRIST — they appropriated His Name and the prestige of His Name in order to deceive the world, and to HIDE from the world the MESSAGE that Christ brought. But, in this end-time, when the end of this age is at hand, this same Gospel of the Kingdom of God — the GOVERNMENT of God-being born into the family of God — this same Gospel is now once again going to ALL THE WORLD! That prophecy is being fulfilled in "The WORLD TOMORROW" broadcast and in the pages of The PLAIN TRUTH"! To fully understand the significance of these prophecies, you need to know where the United States and Britain are mentioned in prophecy. This question is answered in our booklets "The United States and the British Commonwealth in Prophecy" and "1975 In Prophecy." A copy of these booklets can be obtained free from this website.